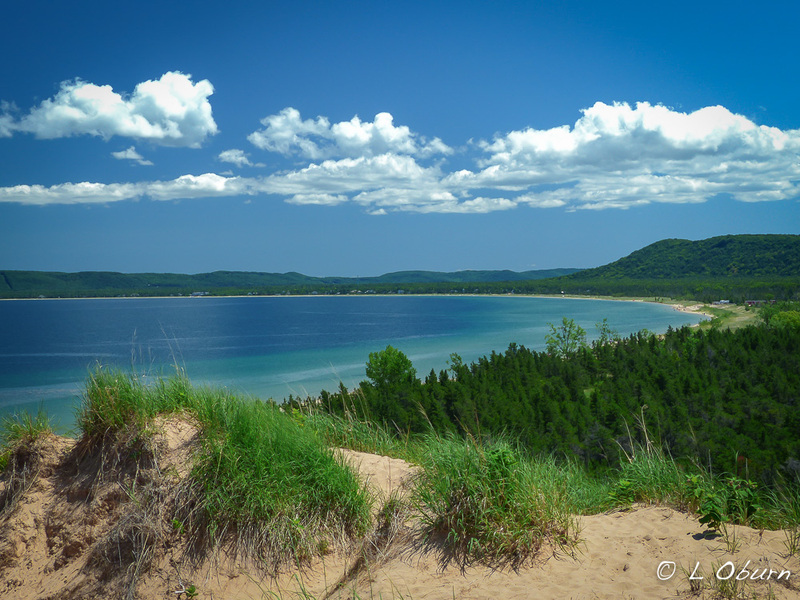 Wildflowers, Dunes, Turquoise Waters, and a Sleeping Bear…Shhh! Powerful earth-moving forces of ice, wind, and water, most occurring during the Ice Age, swept glaciers down from Canada, creating the diverse tapestry known today as Sleeping Bear Dunes National Lakeshore. This 35-mile stretch of land along Lake Michigan, in the Leelanau Peninsula (the “little finger” in the Michigan mitten), is dotted with “perched dunes”, formed by glacial sands deposited on plateaus high above the shore. Where shipping and commerce fueled this region in the 1800’s, today tourism has stepped in, and there is much to tantalize vacationers year-round, given the pleasant summer climate and 80” of snowfall each year. A dramatic National Lakeshore tops the list, but not to be overlooked are miles of sandy beaches to explore, wind-swept bluffs rising 450’ above Lake Michigan, lush forests to hike in the summer and cross-country ski in winter, crystalline inland lakes to canoe and kayak, miles and miles of paved trails to bike, picturesque lakeshore villages to enchant – the list goes on and on. It’s no wonder Good Morning America named Sleeping Bear Dunes National Lakeshore the “most beautiful place in America” in 2011. Indigo Bluffs Motorcoach Resort and RV Park is where we chose to stay and although the RV Park was a bit crowded, it still had a peaceful feel to it. Those who travel in a Class A can get a bit more pampering next door at the Motorcoach Resort. With so much to offer in the area, our first stop was the Philip A Hart Visitor Center, where we grabbed some hiking maps, watched a short film, and peppered the rangers with questions about area activities. A 10-mile bike trail (each way) that continues to grow, with plans to extend it another 17 miles. This beautifully paved trail currently connects the village of Empire to the artsy town of Glen Arbor. Parking is available off-road near the trailhead or you can leave your vehicle 2 miles away at the visitor center, which we did. 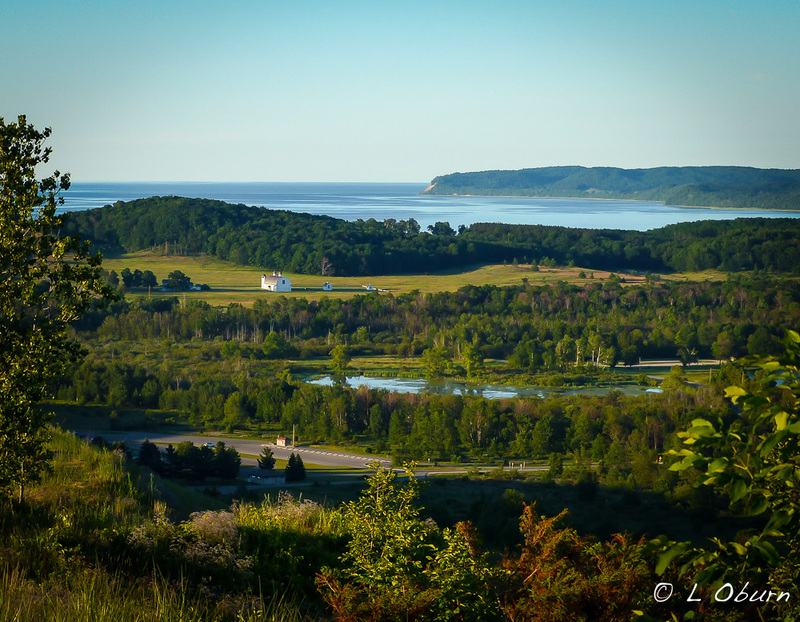 Stop to explore historic Glen Haven along the way and take the one-mile dune hike to Sleeping Bear Overlook, for some great views of Lake Michigan. The Heritage Trail is groomed in the winter for those cross-country ski enthusiasts. Named after a local lumberman who helped to build this road, this 7.5 mile drive takes you through beech-maple forests and some spectacular lookouts, the most popular being Lake Michigan Overlook, where an observation tower sits 450′ above the lake level. Many hopefuls come here to experience a special sunset or tackle the steep dunes. We were among them but Mother Nature did not cooperate during our stay. I had to join the throngs and do the Dune Climb, a very steep climb through loose dune sand that will leave you a bit breathless, as will the run back down. The Dune Trail can be taken from the crest of the Climb, the most strenuous hike in the park, 3.5 miles through loose, shifting dunes. No alligators to be found here but 8 miles of beech-maple forests through rolling hills and views of Lake Michigan and the Manitou Islands make up for the lack of reptiles. Although NPS is in the process of preserving this area dotted with turn of the century farms, it still makes for a picturesque bike ride down lazy country roads, while you inhale the sweet fragrance of hay and wildflowers strewn across the meadows. This pristine city on the shore of Lake Michigan is the largest producer of tart cherries in the country and the annual Cherry Festival was in full-swing when we arrived. We did manage to sneak in and score some grass-fed Michigan jerky (yum) and avoid the carnival scene. Traverse City also offers four bike trails, kayak launches, several vineyards in the surrounding countryside, seasonal farm stands, and a wide assortment of brew pubs. We stopped by the North Peak Brewing Company for a sampler…very tasty! We find ourselves back in northern Michigan again almost three years since we began this roving lifestyle, having watched the fall colors change our last time through. I had forgotten how striking the landscape – carpets of wildflowers, undulating sand dunes, crystalline turquoise waters, and air so fresh it is intoxicating. I lived in Traverse City a few years before moving down to Chicago, and I miss it constantly. That area of Michigan is so incredibly beautiful that it’ll always have a grip on my heart. Alligator Hill is one of my favorite trails, too. I know that bench! So glad to see some love and appreciation for this wonderful slice of earth. We loved Traverse City and only wish we had more time to explore the area. One week was just not enough. We both marveled at just how pristine everything in this part of MI has been. Glad you enjoyed the post! Looks like another beautiful stop in Michigan, with all the things we love. It definitely goes on the list! We are enjoying being back on the road again but do miss the west. We don’t know for certain when we might be back at San Elijo but we do plan to spend part of the winter in So. Cal. Perhaps we can get together? What a great post! I’m so glad you were able to do and see so much, and take such beautiful pictures, even though the weather was not always cooperative. I love that you include the history and other information about what you are showing us. I remember the last time you were through there, that you had such a great time, too. It’s nice to know, that Detroit is not the only place in Michigan. Thank you so much. Michigan is a beautiful state and, although the weather hasn’t always cooperated, we still got plenty of nature time. Thanks Pam! We have loved visiting Michigan again and are experiencing cooler weather, another plus, although today it is in the 50’s and raining. Having said that, I will take even this over hot, muggy weather. How beautiful! At some point we will make it to this area. Your pictures of it are just gorgeous, esp. The sunset. I was hoping for so much more with that sunset but it was not to be. The dunes and the lakeshore were pretty special. Thanks poppy. Lake Michigan is gorgeous! Thanks so much Rick. We had a great time at Sleeping Bear Dunes and with that name, I just knew there would be a wonderful Native American legend involved. The cloud formations and the stunning hues of the crystal-clear lake were fabulous! Three years ago we spent a week at Pictured Rocks National Seashore and had a fabulous time. I cannot wait to see your photos. I liked mine and I knew so very little about photography back then (now almost know enough to be dangerous), so I can only imagine what images you will capture. What a wonderful post – from the Indian legend to your beautiful photos and descriptions. We”re looking forward to exploring that area in the next couple of years. Now we have a little taste of what it offers. Now it’s my turn to gawk at your gorgeous photos, LuAnn. The cover photo is just spectacular and I love the daisies too, along with all the others. You’re in a beautiful part of the country that blew me away on our brief tour there. You make me want to go back and do all those hikes, since we were lazy and just did the drive…!! Thanks so much Emily! We had forgotten how beautiful northern Michigan is. We could have done more hiking and biking if the weather had cooperated but we thoroughly enjoyed our time here. Fabulous header photo! LuAnn, And all your captures on this beautiful post. You know, we will not make it in this area this year or ever. So I will just have to rely and gawk at your adventures and enjoy the place with you. I would have love to do the dune walk! Great post and pictures, thank you. Glad you enjoyed the tour MonaLiza. We missed Sleeping Bear Dunes when we came through Michigan three years ago so glad we got to see it this time around. We don’t see ourselves coming back either so we took in what we could while we had good weather. What a lovely part of the country you’re showing us with your great images. The closest I’ve been was across the border on my Canadian trip, at Sault Ste Marie. Thanks for showing me what I missed! I’ll definitely skip the dune climb though. We were in Sault Ste Marie three years ago but didn’t get to Sleeping Bear Dunes. Since we don’t see ourselves getting back out here again, we decided it was now or never. We are glad we took the time. While everyone out west is probably dealing with some pretty warm temps, we are sitting in the low 50’s right now. I love the name, “Sleeping Bear”, in honour of that devoted mom. What a sad story though. What an energetic time you had in those dunes! I’m sure you slept very soundly that night. 🙂 Thanks for showing me some more of your beautiful country, LuAnn,. The lake is really stunning, and the wildflower carpets must have been a lovely sight to behold. It is a lovely part of Michigan for certain. Thanks for stopping by Sylvia. What a wonderful, rich myth, they don’t pass oral traditions like that anymore! I love all the different things there is to do at lake Michigan, although I may add that you can also read a book but I am being picky. I always enjoy hearing your samplings of the local drinks as well, that never fails to put a smile on myself. It would be rude not to sample them with such a number and you are definitely not the impolite sort. Books and nature, it is hard to know which to pay more attention to in such surrounding, it is a good problem to have though. That is a beautiful part of the country, and the air is fresh… 🙂 Thank you for taking us there, LuAnn! Beautiful photos and loved the legend, LuAnn. Especially liked the photo of the”ants” on the sand dune! Beautiful. I have to make it there someday, thanks for the heads up! What a fabulous tour, LuAnn! We’ve been uncertain as to whether or not we will ever venture into Michigan — too many mosquito horror stories, for one thing — but your photos and writings make me really want to go there. Thanks for offering such a wonderful recap of your adventures. This is absolutely stunning LuAnn! Have you ever been to the North Shore of Lake Superior in MN? Even more rugged than Lake Michigan and beautiful in its own right. Your photos testify to its heralded beauty. That second pic is something they base on to make a tapestry. Silly me, I know of the dunes here in California but have yet to actually explore one. Thanks Rommel! I have those California dunes on my radar when we get back there this winter. Love the shot of you sitting on the bench! Your photos are gorgeous! Perhaps one day we will travel up that way; it looks stunning. I can’t imagine climbing those sand dunes! Not me! This region looks as enchanting as that legend Luann. Your photos do it full justice, especially the one of the view over lake Michigan. Thanks Madhu! We are seeing some beautiful country in our travels.